A view of the partial solar eclipse in May 1994. Spectators in western North America are positioned perfectly to view October 23rd’s partial solar eclipse. October 22, 2014 – On Thursday, October 23, a partial solar eclipse will be visible throughout Colorado, beginning at 3:18 p.m. and ending at 5:44 p.m. Partial solar eclipses occur when the moon blocks part of the Sun from view. During Thursday’s eclipse, about half of the Sun will be hidden from view. Unlike a total solar eclipse in which the entire Sun is blocked from view, a partial eclipse can be viewed across a wide geographic area and is a slow-motion event. The Moon typically takes more than two hours to cross the Sun’s disk. 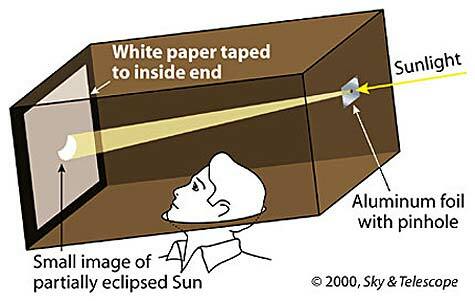 The safest and most inexpensive watch to watch a partial solar eclipse is to create a pinhole projector. Place a pinhole or small opening in a card, and hold it between the Sun and a screen, which can be a sheet of white paper, which is a few feet away. An image of the Sun will be projected on to the screen. This is a great way to share the eclipse with children. It’s easy to set up a basic pinhole projection system. A projector doesn’t have to be that elaborate. 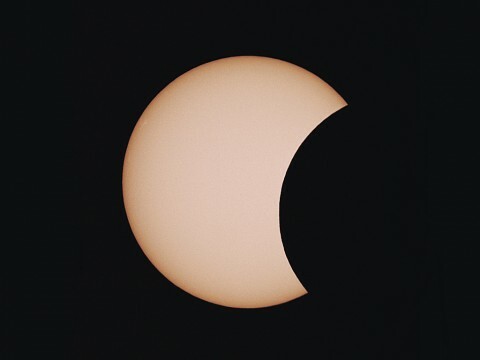 If you sit under a tree with a sheet of white poster board on the ground, the overlapping leaves will create numerous pinholes and project an image of the eclipsed sun onto the white poster board. A kitchen colander will also work. You can point binoculars toward the Sun and project the bright disk onto a white card a couple of feet behind the eyepiece. DO NOT look through the binoculars directly at the sun! You can look at the Sun directly through glasses equipped with special solar filters, or through a dark #13 or #14 rectangular arc-welder’s glass. It’s important to note that regular sunglasses, no matter how dark the lenses are, do not provide adequate protection for solar viewing. Fiske Planetarium in Boulder is selling protective glasses to the public for $2.50 before Thursday or $5 on the day of the partial eclipse. Fiske is selling them from 9 a.m. to 5 p.m. There are Sun-specific telescopes that are safe for viewing an eclipse. Check with your local observatory to see if they plan to have a public viewing. A solar eclipse can only happen at the time of a new Moon, and in particular when the Moon passes directly between the Earth and Sun. This alignment occurs only occasionally, rather than at every new Moon, because the lunar orbit is tipped about 5° to Earth’s orbital plane and so the Moon’s shadow usually misses Earth entirely. The next total eclipse of the Sun will occur on August 21, 2017.